One of the beautiful cool climate plants, Kalmia latifolia, which its very attractive pink flowers will grow well in a range of climates. The trick to growing these free flowering plants is to give them enough sun to promote good flowering, and enough shade to protect them from the heat of summer. This is not difficult to achieve, Kalmias will grow well in morning sun and afternoon shade, and are suited to growing near the drip line on the afternoon shaded side of a deciduous tree. Glossy green foliage year round is topped off be the starry flowers in spring. When in full flower this is a most attractive plant, the bush is covered with flowers, and the ground beneath is a carpet of petals. This is a plant that prefers a well drained, moist and slightly acidic soil, so it makes a great companion for Camellias and Rhododendrons. Dig the soil over well before planting, adding some well rotted compost and aged cow manure. Make sure the soil is well drained yet moisture retentive. Plant, and water in with a liquid seaweed fertiliser. 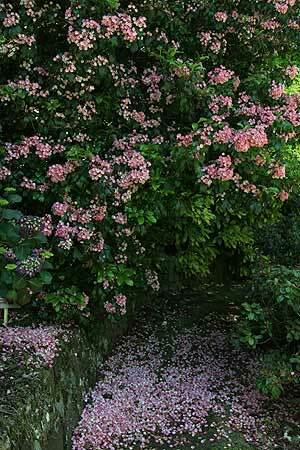 Fertilise with a camellia and rhododendron fertiliser. 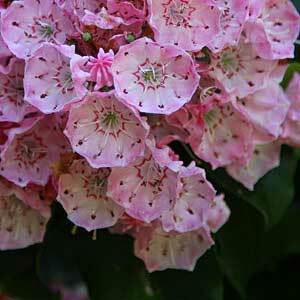 You will find that once established, Kalmia or ‘Mountain Laurel’ are an easy care plant. In good condition they will require little extra water except in very dry hot summers. K. angustifolia ‘Nana’ – A smaller growing variety. K. latifolia ‘Ostbo Red’ – Red flowers as the name suggests. K. latifolia (Mountain Laurel) – Very attractive pink flowers.